Click your or arrow keys to move the card ahead! For your IPAD swipe the screen. 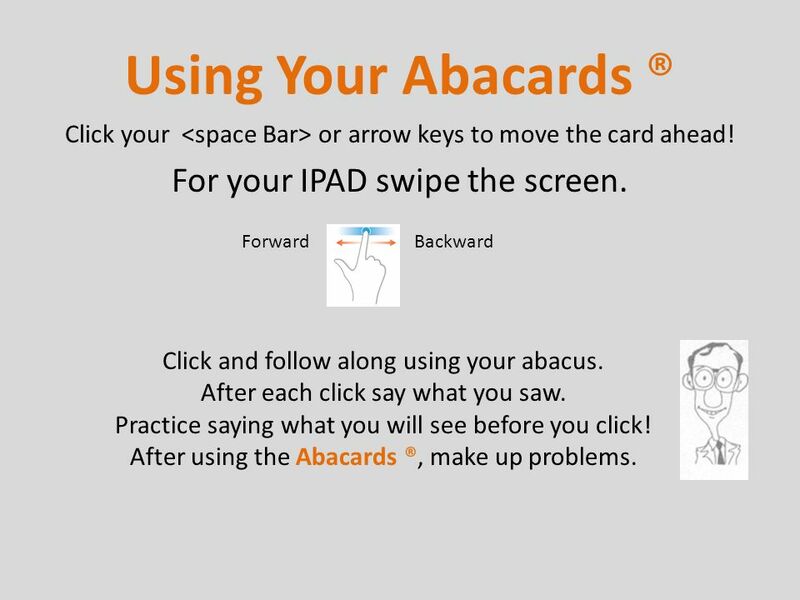 Using Your Abacards ® Click and follow along using your abacus. After. 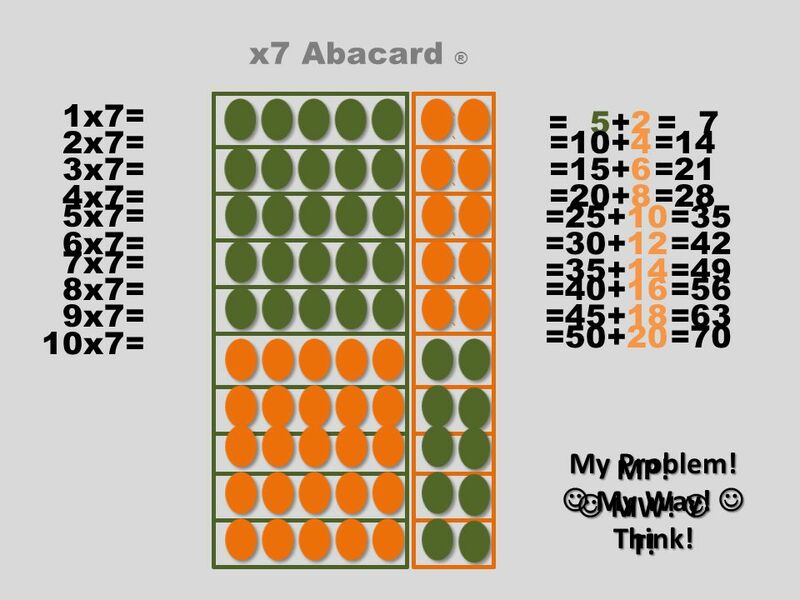 2 1x7= = 7= 5+2 x7 Abacard ® ` 2x7==14=10+4 ` 3x7==21=15+6 4x7= ` =28=20+8 ` 5x7= ` =35=25+10 6x7= ` =42=30+12 7x7= ` =49=35+14 8x7= ` =56=40+16 9x7= ` =63=45+18 10x7= ` =70=50+20 MP! MW! MW! T! My Problem! My Way! My Way! Think! 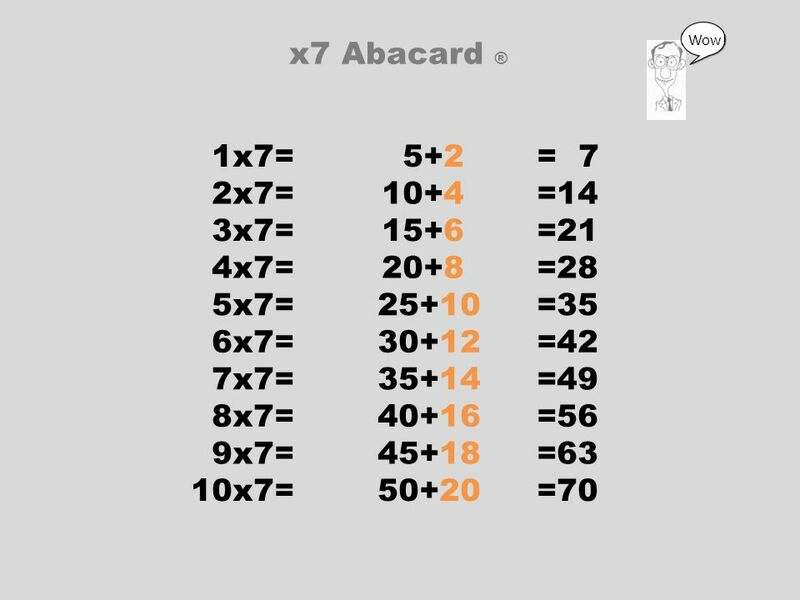 3 1x7== 7 5+2 x7 Abacard ® 2x7==1410+4 3x7==2115+6 4x7==2820+8 5x7==3525+10 6x7==4230+12 7x7==4935+14 8x7==5640+16 9x7==6345+18 10x7==7050+20 Wow! Download ppt "Click your or arrow keys to move the card ahead! For your IPAD swipe the screen. Using Your Abacards ® Click and follow along using your abacus. After." 1 st Grade Sight Words 1 st Six Weeks Ms. Hedegaards First Grade Class Suggestions for using this powerpoint to study sight words: Week 1: Click through. Week 15 Present one slide at a time for up to 10 seconds, asking the learners to read out. When you get to the last word, start again but leave the word. Love Lifted Me Click here to play The slides advance automatically with the words. Inanimate Alice episode 5 In this story you need to click the arrow or the player to proceed. Click your mouse to move the card ahead! Work with a buddy using two Abacuses. First click and follow along using your abacus. After each click talk about. LIL LANGUAGE SCHOLARS HOME The pictures will come up automatically. The first time through click on the screen to hear the Spanish word that. Inanimate Alice Episode 5: Samoa This story uses images, text and sound : turn on the sound on your computer. Use your mouse and click on the arrows to. Enhancing early numeracy using Abacards ® with the 10x10 Abacus. Play Patterns More Than One Way Visual Kinesthetic Algebra Thinking Information about. Brussels Sprouts Tree Display Click on the green arrow to go forward step-by-step instructions. Week 13 Present one slide at a time for up to 10 seconds, asking the learners to read out. When you get to the last word, start again but leave the word. Have a friend hold up a six sided dice against his head. Use your “x-ray” mind to tell what number is against his head. How can this be done?! Abacards. Week 11 Ideally, prior to showing these slides, print the slides and cut up the sentences and pictures. Ask the learners in groups to match them, then.